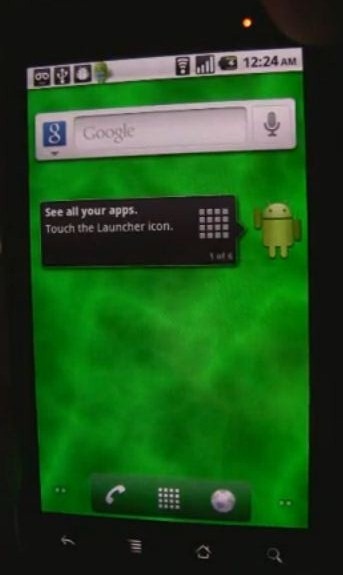 A video has popped up which shows Nexus One running the upcoming Android 2.2 Froyo update. It is difficult to say whether or not this is really the Android 2.2 (Froyo) update running on the Nexus One, but one thing which we are sure of is that it look different, as also apparent from the screenshot below. Video after the break. In the video, a user demonstrates different HTML5 content which appears to be running very smoothly on the Nexus One, thanks to it’s powerful hardware. But if you skip the video all the way to 6:31, you’ll notice a very different home screen (with a new launcher) compared to Android 2.1. Could this possibly be the upcoming Android 2.2 (Froyo) update? or is it just a custom-made home screen launcher? In any case, check out the video below and judge it for yourself. I think at 6:31, it's the new home screen we'll see in Froyo. It's essential to have a quick shortcut for phone dialer and web browser which make up the concept behind having this device. HTC's Sense UI already has this sense. First, and umm… I don't see a video anywhere on my screen (on a PC, latest Flash player, refreshed several times) =o The space is there, but it's just showing an empty blank square. Anyway, I can't wait untill this comes out! WOOOOT!!! The user was from Adobe and demonstrating Flash running on the Nexus One.